The Enhanced Performance Kit for Compact Models contains a fully assembled slide and Fulcrum trigger, everything you need to completely customize your Glock. The Compact Kit is intended for the Tactical/Defensive user, and features a 1704 billet stainless steel slide complete with a ZEV parts kit. Slide also includes ZEV combat sight set with fiber optic front. Slide is pre-cut for use with a Trijicon RMR, but has adapter plate installed so it is ready to shoot out of the box. The trigger is the ZEV Duty trigger, designed for tactical defensive use. Slide availble in black or burnt bronze. Mfg: Zev Technologies SPECS: Fits - Glock 19 or 23 frames. 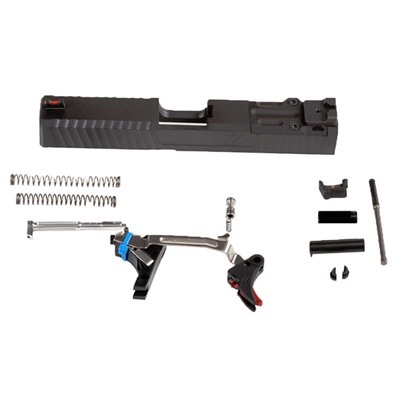 Contains - Slide, front & rear sight, RMR slide plate, firing pin, firing pin spring, Fulcrum Duty Trigger Kit, extractor, extractor assembly, firing pin cups and channel liner. Does not include barrel or recoil spring mechanism.